Cowhide leather should be cleaned to remove dust, dirt and other debris that can damage the surface. Tanned cowhide leather consists of many fibrous strands, much like a sponge. The fibers are so tightly compacted they aren't apparent until the leather is ripped or torn. 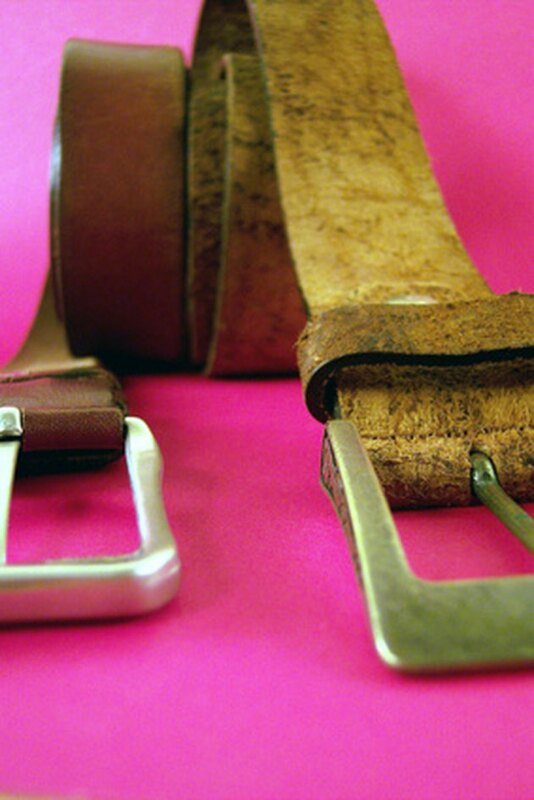 According to a Government of Alberta Agriculture and Rural Development publication, once leather become dirty and dry it becomes dry and brittle. Proper cleaning helps maintain healthy, moisturized leather. Cowhide leather often is found in tanned and hair-on versions. Hair-on cowhide leather is treated with natural oils or chromium to keep a soft and flexible texture to the leather. Cleaning should be kept at a minimum to protect the hair on the hide. Gentle cleaning can remove dust, debris and stains. Gently brush dirt and dust from the leather using a soft brush. Dip a clean, white rag in warm water. Wring out excess water. Rub the rag on a bar of saddle soap. Work up a light, sudsy leather. Scrub the surface of the leather with a light touch. Work in small sections. Rinse immediately after each section with clean, warm water. Rinse the rag completely between each section, switching to a new rag if it becomes soiled. Dirty water or suds can cause leather to stain. Once the leather is 7/8ths dry, use a clean, white rag to apply a light coat of leather conditioner. Vacuum the cowhide. Use a hard-floor setting, a shop vacuum or a hand vacuum. The rotating brushes on a regular vacuum setting may pull the hairs. Add a squirt of dish washing liquid to a small bucket of warm water. Use a clean, white rag dipped in the soapy water to blot any stains gently. A fine-toothed comb can help remove any mud or loosen dried, crusty stains. Always move with the direction of the hair growth. Blot with a clean, white rag and clean water to remove the soap. Allow the cowhide to dry thoroughly. The hair may be brushed with a soft brush once dry to remove any clumping of the hair.